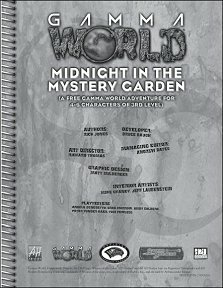 An introductory adventure for Gamma World. Publisher's blurb: "The player characters (PCs) are all young members of or visitors to a small village in the Gamma World wilderness. The residents have been struck with a disease that is killing them slowly. However, they know of a place where a cure can be found: the so-called 'mystery garden.'"